Top 3 Promos of the Week !! Just a week old Madhubala- Ek Ishq Ek Junoon has already grabbed the eyes of many and have been getting awesome reviews…..And today after seeing the new promo the audience are all the more excited because it officially announces the arrival of the star of the show Madhubala, and also the come back of Drashti Dhami, popularly known as Geet then…..It shows her leading a normal life inspite of being born in a film set, in an atmosphere filled with shooting activities…She travels via auto, bargains with the Vegetable vendor on the price of Tomato and is followed by goons on whom she attacks with her pepper spray…….Its a very simple and sweet Intro, with Madhubala aka Drashti's beautiful fear filled eyes being shown on her moving her pouch/bag…….But then like the voice over mentions, how did this normal living, simple looking girl step into the world of dreams, into the world of Cinema……Well Jaanne ke liye dekhiye Madhubala Ek Ishq Ek Junoon..
Top 10 Shows of the Week!! Rangmunch is back with the score card for this week. So lets take a quick look at the TRP Ratings of our favourite shows. We will be back again with the TRP ratings, till then Keep watching your favourite shows on Television. 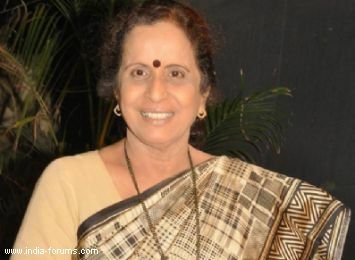 Usha Nadkarni to enter Madhubala! The viewers of Colors tv popular show Madhubala - Ek Ishq Ek Junoon are soon going to see a known face in upcoming tracks of the show. We have already reported about Ahsaas Channa and Ravi Gossain being part of the show and latest we hear that a known face from Pavitra Rishta has been finalized to play a pivotal role in Madhubala. Yes! Usha Nadkarni, who is popular for playing the character of Savita Deshmukh in Zee Tv's show Pavitra Rishta is now all set to make her entry in Madhubala as Mukund's mother. We got in touch with Usha to confirm the news. She confirmed the news saying that, "Yes! I am playing the role of Mukund's mother in the show. I don't know much about the character as I haven't started shooting yet. Along with playing the character in Madhubala, I'll be seen in Pavitra Rishta." I think Gurmeet is an excellent dancer and am sure he will do well in Jhalak Dikhhla Jaa. I would just like to wish him all the best! A grand set, huge star cast and unique plot, do you think ‘Madhubala – Ek Ishq Ek Junoon’ can be a tough ompetitor to other popular daily soaps and reality shows? You can definitely say this is a very hatke show. Unlike regular soaps where you see drama between saas-bahu and father-daughter here you will get to see what happens in the life of a junior artiste. I can’t comment if we are considered a tough competition, I also really don’t know how the show has fared till now but I can say that we all as a team are putting our best foot forward. Hope the hard work pays off! The initial response to the show is amazing. How do you feel? In the first few days I thought its going well, like how it should be. Then when my entry was aired I was honestly taken aback. My fans were frantically calling me, messaging and tweeting. I was shocked. Even my friends who usually don’t watch a lot of TV called me and that just made feel ecstatic! Your character in ‘Madhubala – Ek Ishq Ek Junoon’ is completely different from your previous shows ‘Geet’ and ‘Dill Mill Gayye’. How did you prepare for the show? I have completely given myself to the director, I do whatever he says. Till now my role has been of a simple girl who lives with her family in a chawl so it hasn’t been anything unusual for me. Have you come across any Bollywood offers so far? I am just looking to focus on Madhubala and TV in particular. Will think about Bollywood later. Your fans have huge expectations from you, does it make you nervous? It honestly makes me nervous. I think am putting my best efforts and hoping that my fans would appreciate. And I know they will because they love me! Your previous co-star Gurmeet Chaudhary is now on Jhalak Dikhhla Jaa as a contestant. So we know you have worked as a dance instructor before, any advice to him? Any words of encouragement? A new man named Mukund is going to enter into Madhubala's (Drashti Dhami) life who will fall in love with her in Colors Madhubala Ek Ishq Ek Junoon. Manish Naggdev will play the role of Mukund. Mukund will be seen as a Maharashtrian Brahmin and will meet Madhubala in a bus. Mukund is a confident salesman who will get impressed with Madhubala and will come to know that she works in a beauty parlor. Following this, he will chase Madhubala and enter her parlor. Madhubala gets shocked and finally confronts him. After talking, Madhubala will come to know that Mukund is a nice person. They will meet often and Mukund will fall in love with Madhubala and will confess his love to her. This is one pataka of news. Gear up all Drashti Dhami, Vivian Dsena and Sukirti Kandpal fans. Vivian and Sukirti entered into the hearts of millions playing Abhay and Pia in Star One’s vampire saga, Pyaar Ki Yeh Ek Kahaani. Vivian is currently seen as the male lead, R K, in Colors’ Madhubala-Ek Ishq Ek Junoon wherein he will romance Drashti Dhami. On the other hand, Sukirti has been signed to play the character of Jazz in Jay Mehta Productions’ show, Rab Se Sona Ishq on Zee TV. We also hope the same, Sukirti. Good to see you back on television!!! Din ce vad si sotia lui Vivian face parte din clubul umflatelor..
Football fever has currently gripped the entire world, thanks to the ongoing EURO CUP 2012. And the enthusiasm has caught the fancy of your favourite TV stars as well. 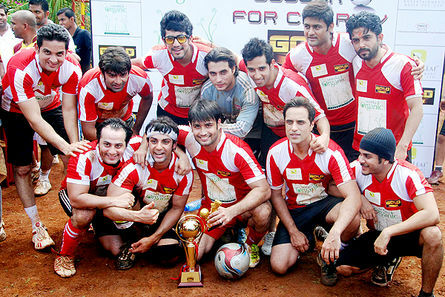 Today (16 June 2012) early in the morning television actors played a super cool football match with the CINTAA members at Juhu, Mumbai. The event was conducted by Golds Charity. And the players who ran on the field were, Karan Wahi, Vivian Dsena, Raj Singh Arora, Manav Gohil, Barun Sobti, Kushal Tandon, Sailesh Gulabani, Suyash Kumar, Jay Soni, Vikas Kalantri, Ashish. Team of actors was christened Celebs Eleven while the CINTAA team was called the Union. And guess what? Celebs Eleven won the contest hands down with a score of 7-0. The winning amount of Rs 50,000 will go to the CINTAA union for the betterment for the technicians. The Celebs Eleven team played really well and out of the total number of goals, Vivian hit the net five times whereas Jay scored the ultimate master goal sealing the score 7-0. Raj Singh Arora shared, "I loved the 11-year-old kid from the other team as he was the only player with a lot of courage. For me, he was a master player." Suyash Kumar, who is also a professional cricketer, enjoyed the game thoroughly as he told us, "I received a call last night to play the game and I took it up. It was a nice experience." Television heartthrobs came together for a special soccer match to support the junior artists of the industry. The proceeds of the match will go towards supporting the FWICE members who require monetary help for emergencies. Popular actors like Karan Wahi, Vivian Dsena, Jay Soni, Barun Sobti, Manav Gohil, Saillesh Gulabani and many others played a game of soccer against the FWICE members. The celeb team won by a landslide margin of 7-0. Well, these soccer lovers also played to support and promote the game in India. Captain of the celeb team Karan Wahi, last seen in Kuch Toh log Kahenge, said, "Whatever money came to us via this game we will be giving to the junior artist association. There are two more reasons to play this match, one is that soccer in India needs improvement and the other is that very few people play this game." Adds Madhubala actor Vivian Dsena, who is a professional player, "I would leave all my work and run to play a game of football. I just love the game. I had informed the production house in advance that I need a day off for this match." Vivian's fiancee Vahbbiz Dorabjee (also his co-star in Pyaar Kii Yeh Ek Kahaani), was also present at the match to support him and seems like the lady luck was smiling on him. He turned out to be the highest goal hitter of in the match (he scored four goals). He says, "The moment my better half entered I did my first goal and many followed after that. She is my lucky charm."" So true! Gurmeet Choudhary opines Drashti Dhami will rock in Madhubala too! Call it their wonderful screen presence or the invincible charm they had created together on the small screen, talks about Gurmeet Choudhary and Drashti Dhami go hand in hand. Their incredible act as Maan and Geet in Star One’s extremely popular Geet Hui Sabse Parayi made them rule the roost and win immense love from fans. Though they might not be working together anymore but whenever anyone of them is caught by the paparazzi, question concerning the other is bound to jump in. Moving on, when sources posed the much awaited question to Gurmeet regarding Drashti and her new show Madhubala aired on Colors, all he said was, “Drashti is a good actress, and I am sure she will do a swell job in her new show. I wish Drashti all the very best for Madhubala”. That’s really sweet of you Gurmeet and even we would like to wish you all the luck for Jhalak! asemnator cu cel pus mai sus numai ca aici vb si de Debina ..
Gurmeet Choudhary is certainly the heartthrob of many girls, and the actor is frank enough to say that his huge fan base is one of the reasons why he accepted to participate in Jhalak Dikhlaa Jaa season 5 on Colors. Gurmeet, we wish you all the very best for your stint in Jhalak Dikhhla Jaa. Madhubala Ek Ishq Ek Junoon on Colours has been doing well on the TRP charts since its launch. Just two weeks old and the viewers witnessed some dramatic moments with the entry of Mukund aka Manish Naggdev a Maharastrian Brahmin who fell in love with Madhubala (Drashti Dhami). Maninee Mihir Mishra to star in Madhubala! Maninee Mihir Mishra will soon be seen in Colors TV show Madhubala - Ek Ishq Ek Junoon playing the role of a journalist..
Tellybuzz has been keeping its audience updated with all the happenings of Colors show Madhubala - Ek Ishq Ek Junoon. The recent entry to join the starcast of the show is Maninee Mihir Mishra who is currently seen in Life OK's Aasman Se Age. According to our source, " Maninee Mihir Mishra will play the character Illa Ramani - a high profile journalist, who will play an important role in the track." We contacted Maninee who confirmed the news, " Yes I am playing a high profile journalist. People see me as a journalist and I would love to play the character on screen and also Sourab and Mukul are very good friend and I loved the character." Audience have found one another reason to be glued to the show – Maninee's entry is sure to bring about a new twist in the show! It was often noticed that many actors hide their marital status in fear of getting less attention from fans, but actor Vivian Dsena is different from others. Vivian Dsena is presently playing the role of superstar RK opposite Drashti Dhami in Colors new show Madhubala Ek Ishq Ek Junoon. Vivian Dsena does not believe the fact that success or failure has got nothing to do with your marital status. Vivian Dsena is a family based person and he strongly believes that one has to find time for his personal life. People believe that they don't get work if they are engaged or married. So, they hide a lot of things from this industry. Vivian Dsena further added that he got engaged six months back with Vahbiz Dorabjee and if the marital status effect on work then he shouldn't be getting work. No one cares what you work after pack up from the show. Success and failure depends on your acting and job. I am commitment-phobic and won't leave anything midway, avers Vivian Dsena! Television's heartthrob Vivian Dsena is thrilled to play a superstar in the new show Madhubala Ek Ishq Ek Junoon. And the name coined for the actor is RK. Talking of it, he says, "I am pretty kicked about the fact that people have started calling me the small screen superstar. No one has played a superstar on television in the past". Upon the iconic character in the show, he has actively engaged to justify the character. He opines, "A superstar needs to be idolized, so having a proportionate body was important. I had gained some weight due to my late night shoots," he says adding, "People ask me whether I pay Ranbir Kapoor or Rishi Kapoor or Raj Kapoor in the show. But I don't think I play any of these actors". However, the actor admits that he managed to convince the director to include the famous RK pose in the serial. One being quizzed if he secretly dreams of getting into Bollywood someday, he said, "I never really tried getting into movies because it never gave me a kick. As of now, I am focused on television. I am commitment-phobic. 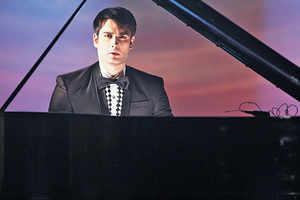 If I have given three years of my time to a show, then I won't leave that midway and pick up or grab another project". Well said Vivian, keep up your good work. Vivian Dsena is thrilled to play a superstar in the new show Madhubala Ek Ishq Ek Junoon.And the name coined for the actor is 'RK'. "I am pretty kicked about the fact that people have started calling me the small screen superstar. No one has played a superstar on television in the past," says the actor. Interestingly, Vivian's look and styling is pretty close to that of the Bollywood star Ranbir Kapoor. The young model-turned-actor, who weighed 98 kilos, had to lose about 12 kilos for this character. He achieved the feat by playing football and gymming for hours together. "A superstar needs to be idolized, so having a proportionate body was important. I had gained some weight due to my late night shoots," he says adding,"People ask me whether I pay Ranbir Kapoor or Rishi Kapoor or Raj Kapoor in the show. But I don't think I play any of these actors. The look and style given to me is as per the latest trend and fashion. If I wear a costume what Ranbir had worn in his films, it doesn't mean that I am playing him," says Vivian. However, the actor admits that he managed to convince the director to include the famous RK pose in the serial. So does he secretly dream of getting into Bollywood some day? "I never really tried getting into movies because it never gave me a kick. As of now, I am focused on television. I am commitment-phobic. If I have given three years of my time to a show, then I won't leave that midway and pick up or grab another project," he says. And even if he says he's commitment-phobic, on the personal front, the 23-year-old Vivian is happily engaged to actor Vahbbzee Dorabjee, whom he met during the shoot of his last showPyaar Ki... "Your success or failure has got nothing to do with your marital status. I am a complete family person. I strongly believe that one has to find time for his personal life. I would rather spend time with my family than party with my friends. People believe that they won't get work if they are engaged or married. They hide a lot of things in this industry. If that is the case, then I shouldn't be getting work, as I got engaged six months back. What you do after pack-up, no one really cares. It all depends on how good you are before the packup when the director shouts, 'Action'." Point noted.